Dental implants are one of the most important advances in the oral health field. They’re an effective and attractive treatment for broken or cracked teeth and can give people back their confidence and their ability to enjoy their food. If your teeth are in bad health and you’re considering implants, here’s what you need to know. Dental implants are a permanent solution for cracked or broken teeth. If you decide to get them, your dentist will remove your broken teeth roots and replace them with metal posts. This procedure is the same whether you’re getting one tooth replaced or all of them. Once your mouth has healed around these new structures, your dentist can attach brand new teeth to the metal foundation. Dental implants require several treatments, but once they’re in they’re a good replacement for old and broken teeth. They also look and function just like real teeth. Dental implants are designed to look like your original teeth and they can replace loose dentures and partial plates that look fake, fall out, and can be painful to wear. They’re also extremely sturdy, and although they can decay if you don’t take care of them, they’re sturdier than natural teeth. Getting dental implants will not only improve the look and feel of your mouth, it will also improve your ability to eat. When you have dentures or broken teeth, your diet becomes restricted and this can result in malnutrition. But dental implants can remove this barrier to good nutrition and health. One of the greatest advantages of dental implants is the fact that they protect and strengthen your jaw bone. When you have missing teeth, the bone around the removed tooth root gets partially absorbed into your body. This causes the jaw bone to become thin and weak, which has a number of implications for your oral health and for your appearance. If you have bone loss, you may not be able to have dental implants without bone grafting first to build up the bone again. Your teeth may also become crooked and uneven, because the bone beneath them is uneven. And in the worst cases, the lower third of the face can actually collapse inwards because there isn’t enough bone to support it anymore. Dental implants can help you avoid this problem. 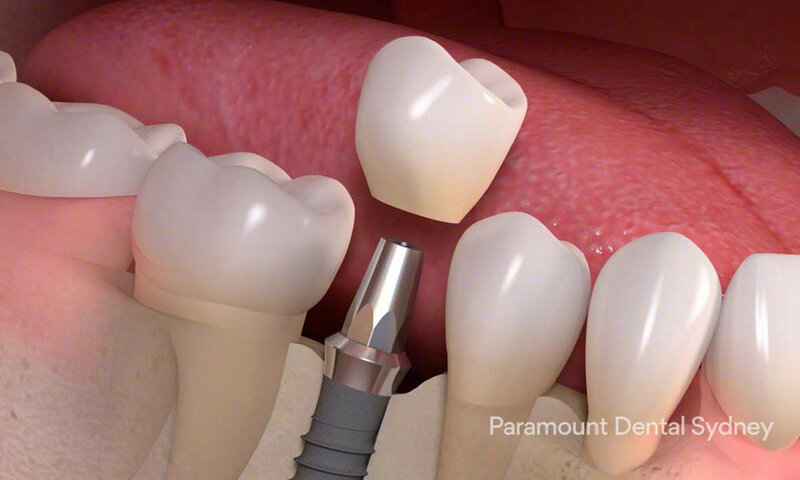 Because dental implants use a screw that’s put into the bone, it protects the bone from being absorbed by the body. The screw also integrates into the bone, strengthening it and protecting it from future damage. Multiple teeth implants replace several missing teeth and their roots. Other replacement options require support from adjacent teeth, which can cause wear and damage and even result in the support teeth themselves becoming loose. But multiple teeth implants don’t require any support, they look and function just like real teeth. If you need all of your teeth replaced because of decay or damage than full mouth implants are the best way to do it. 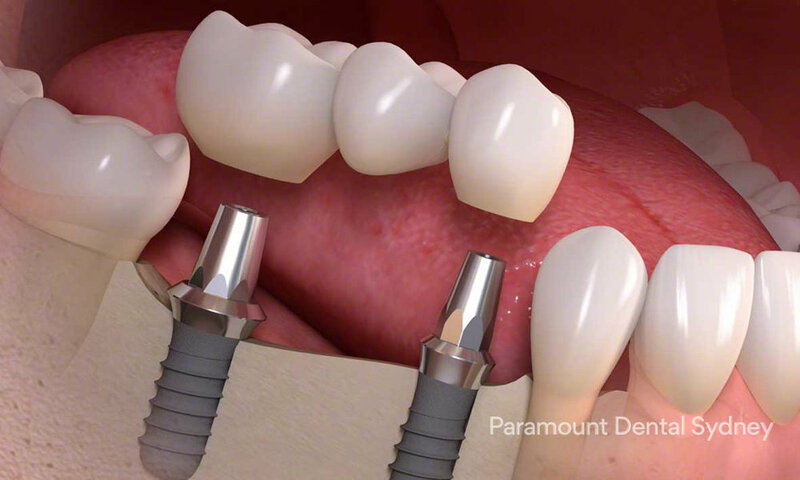 With this procedure, all of your remaining teeth and their roots are removed before dental implants which look a bit like screws are placed into your jaw. While they heal, temporary teeth can be worn over the implant sites. But once the sites have fully healed, new teeth are fixed into place using small metal bars. Once the teeth are in place, you can’t see any of the metal work, and you can show off your great new smile. If your teeth are cracked or broken, talk to us here at Paramount Dental Sydney. Our caring and expert staff will help you find the treatment option that’s best for you.